As a famous historical and cultural city, Quanzhou has a time-honored history of producing snacks, which contain rich historical and cultural connotations. There are many stories about the "food" culture. Quanzhou has special snacks respectively for wedding or funeral ceremonies, offering sacrifices to gods or ancestors, and giving friends and relatives as gifts, such as Bowl Cake, Lantern Festival Ball, Orange Red Cake, Longevity Turtle, Mung Bean Cake, Tender Vegetable Cake, etc. Prepare soup with shrimps, oysters, razor clams and other seafood, add thread-like noodles to the soup, and boil the mixture until it becomes gruel. Prepare some fresh crabmeat, cut Chinese chives into half an inch long, add some sweet potato powder, and mix them properly. Fry it with a frying pan. When the food is almost done, add some eggs. This snack is fragrant soft and very delicious. In the shape of a full moon, Shishi Tian is white in color, soft and tender, refreshing, sweet and tasty. This snack is prepared with high-quality glutinous rice, white granulated sugar, preserved fruit, kumquats and spice. 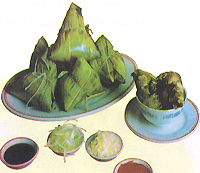 Shenhu fish balls are a famous traditional snack in south Fujian, in the shape of a ball or fish. Bright and snow white, such balls are soft, refined and delicious. Prepared with glutinous rice, mung beans and white sugar, Yongchun Bangshe has been well received by the people since ancient times. As it is in the shape of a turtle, so people call it "Longevity Turtle," or "Turtle."